In Summer season Indian, Pakistani and Bangladesh people have to face load shedding problem. The only solution available to general public is UPS or Inverter. A UPS or an Uninterruptible Power Supply, also known as an Inverter, is an electrical device to provide backup power in the event of a power failure or when there is no electricity. Due to lack of knowledge help shopkeepers to easy fool common people and make huge profits from them. This article help you to know basic knowledge about UPS, Inverter and batteries. Inverter takes 300 to 800 milliseconds for switching from Main power to Battery power and its not enough to remain your computer power-on while the shift. So the solution is clearly a Good UPS which has normally 3 to 8 milliseconds shift time from main power to battery power. The Chinese UPS available in the market are also Inverters not UPS. Which is best UPS Or Inverter? Inverters are good for some home electronics like Fans, Energy Savers and Bulbs but they are not made for Home Appliances like Television, Refrigerators or Computers. 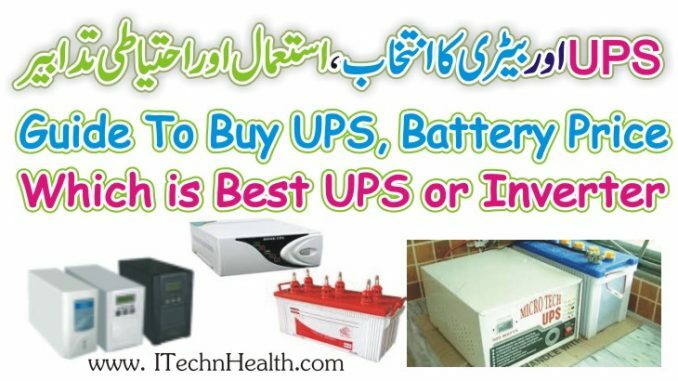 So choose UPS or Inverter according to your preference. If you want to use only Fans, Energy Savers and Bulbs then Inverters are good for you otherwise you must have to choose a good UPS for TV and computers. UPS are also good for charging devices like Mobile Phones and Laptops but inverters are battery killers and if you use inverts for charging of laptop or Mobile inverter can harm these devices. If you are facing light problem in your area like low light or light comes on or off very quickly than inverter also not be able to handle this situation and can damage your home devices. Now you learn the difference between UPS and Inverter so I recommend you to buy a quality UPS according to your needs. If you want to use UPS for your computer than it is highly recommended to buy a branded high quality UPS otherwise it will restart your PC. Battery timing depends Battery capacity not on UPS. No matter how high Watts UPS you are using 1000 Watts or 2000 Watts. If UPS has small battery than it will give small backup time. Usually a 500W UPS can easily run 1 Computer, 2 Energy Savers and2 Fans. So you can calculate your needs before buying UPS if your need is more than this then you will need to buy 1000W UPS. Here is a list of some companies name who provide UPS. So if you are going to buy a brand new UPS for your home then you should first check the specs of your usage devices. Watts Units are used to describe the capacity of a UPS device. Theoretically a 1 kVA system is capable of supporting a load 1,000 watts or 1kilowatt. Due to inefficiencies and the power factor, a 1.5kVA UPS is recommended for supporting the load of 1,000 watts. UPS are available in following capacities. Most cheap brands companies do not sell high rating UPS which can work with extraordinary loads. Here is a price list to help you to choose UPS. After buying a UPS you will also need a battery for your UPS. There are various companies manufacturing batteries like Osaka, Volta, Exide, Phoenix & AGS etc. AGS battery is the Best Battery for UPS in Pakistan. However, other batteries are also work well you can choose any battery from them. There are few things that must be remembered if you really want to increase the life of your battery, acid, distilled water and timely maintenance of your UPS help to increase battery timing. Batteries come in different prices, storage capacities and types. At the fundamental level, batteries are available as dry and wet batteries. Wet batteries contain a liquid electrolyte in comparison to dry batteries, which use a gel. Storage capacities of batteries are rated in Ampere Hours (AH). So a 150AH battery can discharge at a rate of 150 amperes per hour. A 150 (AH) on 1 KVA UPS, may give 3-4 hours of backup time on 4 savors and 2 fans. This backup time will reduce to half if battery power is 75 (AH) ampere. Place the battery in well ventilated environment to avoid any damage. UPS should be placed near to the place of Main Switch board, it will help you get the main supply into UPS and output from UPS to home appliances easily. Try to buy fresh battery instead of old.